For the past few weeks I've been determined to shed light on some of the incredibly talented young musicians in the North East, and how they're working their way through the ranks in a competitive music scene. With in-depth exploration into each artist's career, I've been eager to show off what they've achieved, and also give credit to these artists for what they've been doing. Shores are an acoustic, girl-power duo made up of two 15-year old girls named Abbie and Sally. The girls both performed separately with their own original songs and covers, before joining forces to create Shores. They have been playing together as of the start of 2018, and they both haven't looked back since. Both girls listen the likes of Catfish and the Bottlemen, The Kooks, The Wombats, Blossoms and Ed Sheeran, so indie rock and Pop are definitely two genres that heavily influence them. Abbie and Sally combine their melodic voices to create beautiful harmonies and contrasting rhythms, a trait which is woefully uncommon on the music scene. Accompanying their acoustic guitars, and sometimes ukuleles, the girls have a soft and soothing sound, resonating with their name. Gaining a lot of attention and musical recognition, their 'chill' genre style is easy on the ear and can be pleasing for most people to hear, making Shores instantly likeable. As I have previously mentioned, playing acoustic music on today's scene can be challenging and sometimes disheartening, due to the fact that the region right now is favouring indie bands, so hats off to Shores for doing their own thing and making a pathway for themselves independently. Despite this however, the duo have had quite a few local gigs. Playing at the O2 Academy 2, Surf Cafe and various cafes, they are most definitely paving their future with sensible and reasonable mindsets. Building their way up to the bigger venues, these girls have nothing standing in their way, and I think we'll be hearing a hell of a lot more from them in the future. On the other end of the scale, After Party are a budding group of punk rocking lads who have been playing together for a year and a half. 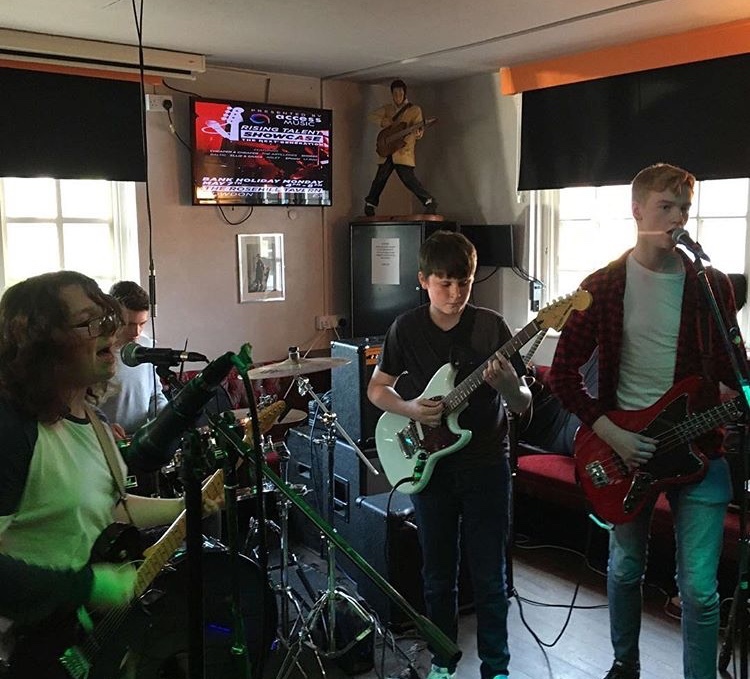 The band is made up of 4 members who are all 15 years of age, including Nathan on lead guitar and vocals, Noah on drums, Sam on rhythm guitar and Tom on bass and vocals. With teen spirit and youthful rage in all of their songs, After Party are in the very early stages of emerging. Having had a few local charity gigs in pubs, these boys are hoping to start gigging in bigger venues soon, and expand their audience in the process. The band have also been through no less than 3 name changes from Cheaper and Cheaper, to Northern Velvet, before settling on their current incarnation,the kind of thing that comes 50 years into a band's career. However I'm not complaining, as 'After Party' is definitely their best choice. The lads already have a few promising tracks out on Soundcloud which have gained them growing recognition and followers. They showcase their music with gritty, indie traits and portray their feelings with hollow lyrics about girls and teenage life. After Party are the embodiment of what is currently popular on the music scene now, so I have no doubt that after a few more gigs and tracks, they can become a lot bigger and a lot more established. I can genuinely feel so much potential radiating off of these guys and I can't wait till they put themselves out there a lot more. The band take influence from some of the greats, such as The Beatles, Nirvana, Radiohead and Oasis. These bands help to sculpt After Party's sound and enforce the rebellious, indie sound which is so very popular today. I have nothing but respect and excitement for After Party as they embark on their musical career path and I don't doubt that the have so much to give. I really would love to see them getting some more gigs, to show people what they're made of.